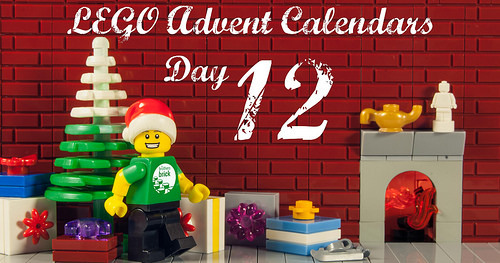 Welcome to Day 12 of our LEGO Advent Calendar countdown. Each day, we’ll reveal the three mini-builds from the LEGO City, LEGO Star Wars, and LEGO Friends 2017 advent calendars along with commentary from our team. If you’re opening one (or more) of these advent calendars along with us, we’ve made sure the pictures and commentary on each day’s models will be behind a jump and posted in the evening every day, so we don’t accidentally ruin the surprise. Let’s delve into Day 12! For Day 12, we have a stand and cup from City, a mini-Millennium Falcon from Star Wars, and a hot chocolate stand from Friends. Chris: Man, I think that’s a better microscale Millennium Falcon than the one Target sold by itself for five bucks a pop. The stands are, well, boring. There’s nothing wrong with them, except that they’re literally just simple stands. Thrilling, eh? Dave: City has entered the Friend’s stand craziness with just a red cup, though it is a good unintentional pairing with the Friend’s hot chocolate stand. The mini-Millennium Falcon is fantastic, and the dark grey cheese slope really screams the deflector dish from Force Awakens. Elspeth: This is a Millennium Falcon in a hot beverage stand sandwich: the filling is the best part! Edwinder: One of these things is not like the others, one of these things just doesn’t belong, can you tell which thing is not like the others, by the time I finish my song? On as serious note, this is one of the better looking versions of the Millennium Falcon that has come with these advent calendars. However, I claim little bit of false advertising as the box image has bit of a color ring around the ship. At a quick glance, I thought there would be colored Christmas-y studs around the top. Dave: It is a Resistance Officer shooting so he has at least at least a 50% chance of hitting the target rather than 0% if he were a Stormtrooper, right? But maybe we should just put this Friends advent calendar out of its misery? Daniel: Who doesn’t love a good bake sale. Proceeds go to parts for next year’s advent calendar. Edwinder: After a hard days work, Resistance Officers get to take a break and have a beverage of choice. Will it be lemonade, Kool-Aid or just milk? Lunch facilities at the Rebel base cafeteria include a target board for practice called “Shoot the Stormie!” and has been one of the most popular attractions this year! Dave: We are halfway through the advent calendars, so we thought we would take a look back at just the minifigures/animals from each advent calendar so far. Clearly Star Wars is in the lead with double the minifigures of City. The Friends advent calendar still only has the solitary mini-doll and three small animal friends. Maybe the Star Wars calendar was front-loaded with figs? City has some catching up to do, and Friends needs all the help it can get. Edwinder: *ding* *ding* *ding* It’s half time! Ladies and gentlemen, on the far left, we have both Scum and Sweet from Star Wars! In the right corner, we have a new contender that will win you over with their adorable and appealing four-legged charmers, led by their fearless leader Stephanie! And in the middle, just for today’s show, Grandma Willis and her famous cookies! Step right up! Take a seat and enjoy the rest of the show! 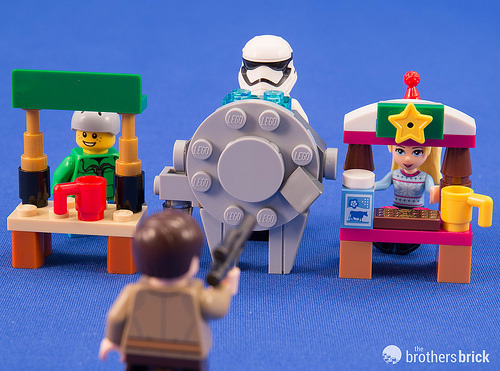 Chris: This image is pretty telling of what LEGO thinks fans’ reasons are for buying various themes of advent calendars. 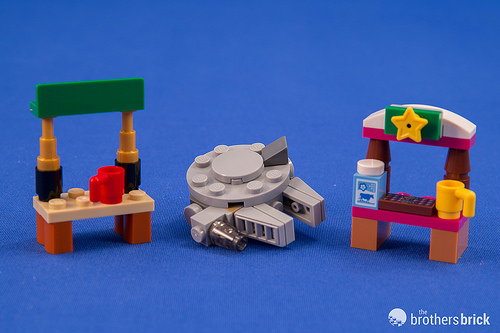 Star Wars is, and has always been (even before LEGO joined the game) about figure collecting.